You may recognize this right away as that super-easy folded cup you learned as a kid! I knew there was a way you could fold a cup you could actually drink from but I wasn’t very interested until I found a clipping from an old Martha Stewart Magazine. 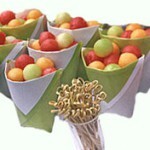 It featured these packets made from glassine paper with parchment paper liners, filled with colorful melon balls and stacked in a row on a tray. (See the complete photo and article at http://www.marthastewart.com/good-things/cups-of-plenty? ) I fell in love with the idea immediately and we used it for my daughter-in-law’s Bridesmaids’ Luncheon in July. They were a big hit! While the glassine is very pretty we quickly discovered that it is very hard to find these days unless you want to order huge quantities directly from China. (If anyone knows a good source for small sheets of colored glassine in reasonable quantities, please submit a comment and share the info!). Of course you can use any paper to make these cups. For food applications, especially if the food is moist (like melon balls) or has some fat content (like cookies), it makes sense to use something which is water- or moisture-resistant. We ended up using Tyvek “paper”, which is not really paper at all but is used like paper. (You have probably r eceived Tyvek envelopes at some time through the mail – Tyvek is a synthetic, and a registered trademark of Dupont). I found some at a wholesale/retail paper store (Kelly Paper in Mountain View CA) and was happy to discover that you can use it in ink jet printers (NOT in laser jets!). To save money, I ordered some large sheets of the Tyvek and cut it to our desired size. I created a design that echoed the background design we had used on the wedding “Save the Date” magnets and printed it on to the Tyvek sheets. We then made the packets using squares of parchment paper for the liners. I was on a cruise where you gave some awesome origami classes. You gave me the name of someone to contact as I wanted to do some card classes on a cruise myself. Do you think that you could give that to me.